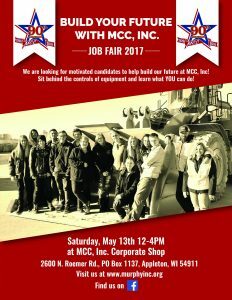 MCC Inc. will be hosting a job fair at our Corporate Office- located at: 2600 N Roemer Road in Appleton. If you are interested in starting a new career with a company that has been around for over 90 years, and offers many opportunities for advancement if you are a driven individual. We offer wages and benefits that will match or exceed anyone in our industry, and encourage our employees to take every opportunity to learn and grow within the organization. PLEASE FOLLOW US ON FACEBOOK TO KEEP UP TO DATE FOR INVITES TO THE EVENT AND ADDITIONAL INFO ABOUT JOBS AND OPPORTUNITIES WITH MCC INC! · Hosted by MCC Inc.